Jim Harbaugh bested Jim Schwartz. Not with a handshake but trap blocks that baited Detroit’s elite defensive line and exposed its not so elite linebacker corps. Not with an emasculating slap on the back but a coverage scheme that cooled Calvin Johnson and forced Matthew Stafford into targeting his tight end, Brandon Pettigrew, to little avail. There is something undeniably enticing about two typically inscrutable head coaches almost coming to blows on the gridiron. A tiny aspect of the vast and essential but largely hidden world of head coaching in the NFL revealed: the need to be the alpha among some of the fiercest, most powerful men on Earth. Schwarz—a letterman linebacker at Georgetown with no professional playing experience—slapped aside, excused, big-brother like, by Harbaugh—a former first-round pick by the Chicago Bears— on national television. But it was the game, the significance of a 4-1 49ers team traveling to Detroit to face the 5-0 Lions, mere days after the Tigers had been eliminated from the postseason, winning, slapping a little mortal fear into the team and its fanbase, that was relevant. Not the scandal that followed. The purpose of a trap block is to exploit a defensive lineman’s natural inclination to penetrate into the backfield, and then to ambush them with a block just as the back is running past. It’s anything but cutting edge, the tenets of which if not the name itself perhaps older than the game of gridiron football. 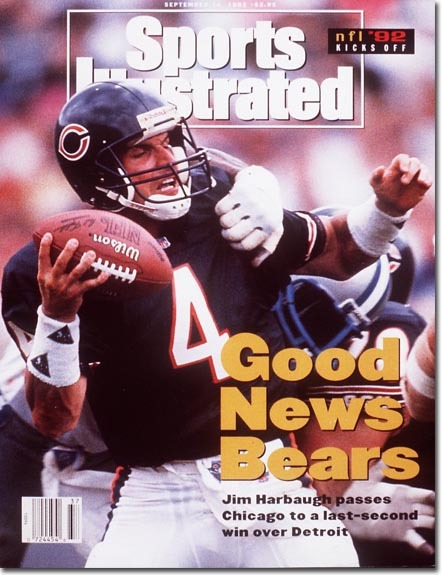 But Harbaugh showed a knack for employing the right tactic at the right time. Gore’s runs of 47 and 55 yards, worth 13% and 24% win probability respectively, both employed trap blocks. Specifically, both where wham plays with tight end Delanie Walker looping in and waylaying Ndamukong Suh. Walker also clinched the game-winning touchdown reception, making him the unsung MVP for the 49ers. The particulars of San Francisco’s coverage scheme will remain a mystery, because though high definition television is now standard, NFL broadcasts still employ the increasingly obsolete focus on the front seven camera angle. The upshot of the 49ers’ scheme though was quite apparent. Stafford, more emerging than arrived, couldn’t build a passing attack around Calvin Johnson. Instead relying on high-volume/low-value passes to Brandon Pettigrew. All-Pro inside linebacker, Patrick Willis, ever an elite run defender and an occasional if deadly blitzer, showed that he has harnessed his reflexes, quickness and awareness to develop pass coverage. He broke up three passes to Pettigrew. On the day, the Lions tight end was targeted 15 times but only converted eight into receptions for a total win probability added of -10%. Before the Handshake Heard Round the World, before the kind of hissy fight that made my schoolmate’s Jr. high slap fests look tough by comparison, before a scandal inspired sportswriters the land over to put down their US Weekly and key up a turgid opinion piece, this was an excellent, hard fought game, between two emerging teams, two storied franchises, that was won not with swagger or intimidation, but strategy and execution. Blitzkrieg by Bosch: Kyle Vanden Bosch sprinted off the snap, sunk his right shoulder into Joe Staley, exploiting the left tackle to circle around the left edge at an otherwise impossible angle, and stripped the ball from Alex Smith and into his own grasp. The attack took less than two seconds of game clock. One of which was spent by Smith patting the ball and swooping it into his windup. The NFL is full of athletes that wow, superior athletes than Vanden Bosch, but that sequence was so efficient and decisive as to be video game like. As if for a brief second, Vanden Bosch escaped the messy bonds of reality and all its incalculable chaos, and did just what he wanted, how he wanted. It was huge when it happened, worth a full 16% win probability. Jeff Backus, Star Maker: While everyone was buzzing on Ndamukong Suh, it was Aldon Smith that looked like the budding star defensive lineman. With 7:50 left in the first half, Smith tore through Backus to catch Stafford in the end zone. That sequence ended with Ted Ginn returning the ball 31 yards, collectively giving the 49ers their first positive win probability since the snap before Vanden Bosch's strip sack. It was the first of two safeties I saw on Sunday. Stafford fought like ten devils to escape. Some many hours later, Donovan McNabb fell into a heap fearing pressure. Smith finished second among all 49er defenders in win probability added (20%), and first among all 49ers in expected pointed added (5.5). Smith will not have the fortune of playing opposite Backus every weekend, but promising isn’t sufficient when describing the still just 21-year old defensive end. The Great Unwashed: If you ever want to indulge in some light misanthropy or get busted looking for an illegal stream, visit the comments section of NFL.com. Between the baffling spelling and threats of violence against other posters, you will find comments that speak to the very heart of a fanbase, like this user’s abundant arrogance and entitlement in the face of his team merely beating rather than dominating their opponent. There has been one shutout all season, and it was by the Steelers against the Seahawks. Obviously, not all Steelers fans or even most are arrogant and entitled anymore than all Seahawks fans are, I don’t know, arrogant and entitled, but every fanbase has its fringe, that thrice distilled jughead that thinks every ref is against them, every season is a Super Bowl berth, and every opponent but a stepping stone to his team’s, rather, his own greatness. On Quality and Type: CenturyLink, the telecommunications conglomerate that swallowed up Qwest, has continued Qwest’s legacy of strikingly bad commercials. Qwest attempted straight-faced camp circa 1994. CenturyLink traded that for faux-artsy direction with an abhorrent pseudo indie song sporting such lyrics as "Set me free. Free from interruptions and slooow down." Maybe this is a damning sign that indie rock is bloated, bled white, out of touch and exploited—often of its own volition. But, anyway, to the point: I searched online for the origins of the song and found a message board in which several posters were not just praising the song, but insistent that it could be on the radio. This speaks to something relevant to the NFL. The NFL is a league of types and specialization. And as such, sometimes a type of player becomes faddish, and signifying elements in demand. Not minor chords and painfully yearning vocal delivery, but a certain height-weight, skill set, position, etc. The best talent evaluators evaluate quality. The worst ape style. The Decline of Donovan McNabb: My friend Spencer is black. This will be relevant in a second, so don’t freak out and assume my lone intent was to write “My friend . . . is black.” That was merely my major intent. The black quarterback hasn’t quite taken off like it seemingly should. The NFL is dominated by black talent. There is no fundamental reason I can think of why any one skin tone should be more successful running an offense than another. Maybe contrast is as captivating in a huddle as it is in Ansel Adam’s Moonrise. Among the 23 post-integration, modern era quarterbacks enshrined in Canton, only one is black, Warren Moon, and Moon took about a circuitous rout to NFL greatness, winning five Grey Cups in the CFL before being signed by the Houston Oilers in 1984. No current or recently retired melanin-rich quarterback has much of a shot. The closest is probably Donovan McNabb. This is something Spencer and I discuss. We all root for kind. I am short and root for short players. Spencer is black, etc. We have talked about Jason Campbell and whether his Mississippi-slow demeanor sets him back. We talk about Michael Vick. And we talk about McNabb, because it wasn’t so long ago that Donovan McNabb was in that 1a tier of quarterbacks: consistently very good, maybe never in the discussion of best in any given season, but in the discussion for top-5/top-10 status season after season. If somewhere along the line, the Eagles broke through and won a title, McNabb may have had an outside shot of joining Moon in Canton. Instead many people think he’s legitimately worse than Eli Manning. Instead of breaking through and confirming his legacy, McNabb has spiraled into a protracted and embarrassing decline. He plays like he has one foot in the broadcast booth: smiling as his team fails, saving face on the sideline after being benched, and, as yesterday, capitulating. He capitulated a safety yesterday, curling into a ball in the Vikings end zone to protect himself against a pass rush that had yet to arrive. Maybe he couldn’t have charged forward; taken a shot but cleared the goal line and preserved the drive. Maybe not even Donovan McNabb, a rare combination of acceleration and toughness, a precursor to Cam Newton and Tim Tebow, could stop the Bears from converting the safety and taking a commanding 82%-18% lead in win probability following the free kick. But he didn’t try. That is my lasting memory of the play. It’s the stink on McNabb’s otherwise excellent career. He converted 19 of 24 passes yesterday, for a quarterback rating of 97.4. That is the stat some Spencer in another city could point to. Someone else with their gut in it, entrenched in a position. Quarterback rating is a nonsense stat, of course, ignoring sacks entirely. Win probability aligns data to what is intuitive. It’s not a perfect stat for all purposes. Winning teams produce win probability, of which we can assign to even inferior performances. But it accords with the feeling of watching a game. It’s why Mark Sanchez is among the most famous athletes in the NFL, despite the fact that he is also one of the worst quarterbacks in the NFL. His 2.31 win probability added in 2010 trumps any season by Donovan but McNabb’s sterling 2004. Win probability added differentiates a relevant performance from a performance that only looks good in the box score. Against the Bears, McNabb’s -4% win probability added was tied for worst among Viking players. His total win probability added on the season is fifth worst among quarterbacks, sandwiched between Kerry Collins and Sanchez. That is what McNabb has become: a respected quarterback that doesn’t help his team win ball games. Fans do not care about completion percentage or quarterback rating. To reference the reductive eloquence of the late Al Davis, fans want to “just win, baby.” McNabb never did, not ultimately, and on his farewell tour, headlining bad teams in the midst of implosion, he isn’t just losing, he is accepting defeat with a smile and a nod. Read this just after lunch, and good Lord, it was like having dessert. Thank you! Seconded. Really enjoyed reading this. Willis was the key -- or one of them. His ability to pass cover allowed the secondary to focus on shutting down Megatron. An excellent article. I hope the title is wrong about this never recurring. To claim that the NFL passer rating is "worthless" because it lacks a sack term is equally well a condemnation of the adjusted yards per attempt stats from which the passer rating derives (see, for example, http://wp.me/p1m41i-kv). And AYA style stats, as Brian Buke has shown in his "How Teams Win" 4 part series, is correlated with winning. Second, by design, the NFL passer rating can fruitfully compare a passer from 1934 to one in 2011. All the play-by-play derived stats can't do that, since pbps don't go that far back in time. David Myers, as Jim Glass pointed out in his Community posts, it is actually very incorrect to use passer rating to compare QBs across different eras. Furthermore, if you have the stats necessary to make up passer rating (passing yards, attempts, interceptions, touchdowns) then you CAN calculate adjYards/att. Only other methods (like air yards, anything involving sacks) will not be possible. Wow this is better than covering the Seahawks dude !